Art is, the synthesis, passionately to observe nature, life and people. It may be that the cutout, details not pass unnoticed by the artist and, in their work, to your style, it also includes details that your imaginative mind and saw that his heart delighted realized. The trace your, add to the detailed observation, movement, the fruits of an epiphany and an essence that only your mind houses and comprises. Then he goes riding the puzzle, until your idea become real to the senses and to be perceived the same way by the viewer. As a game, his work conveys a message. That your heart wants and that your intimate encrypts. He observes all, very careful and realize that the other details, could go unnoticed. 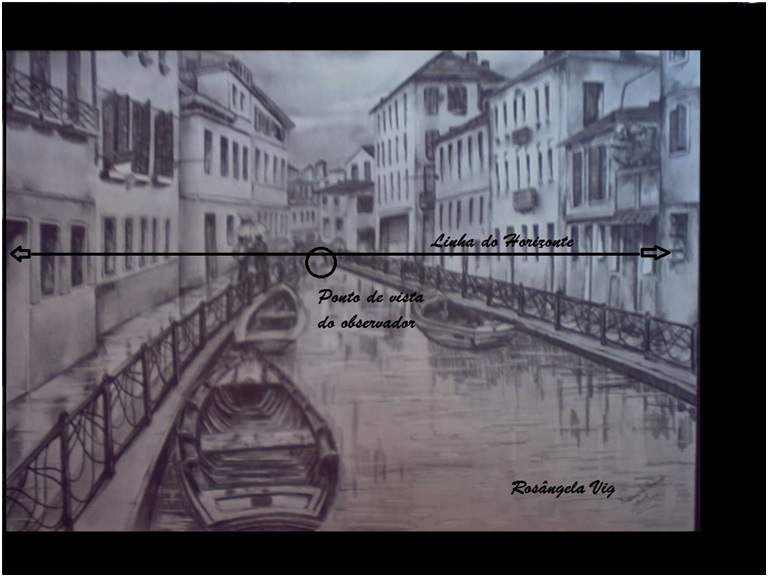 In the case of Painting and Drawing, the first item that the artist is seen as, perspective, determining factor for the work to get volume and distance. For this, it takes a perception of space, on the screen or on paper, starting with the location of the observer, within the scene. The artist has to be seen somewhere in the image and, thereafter, find an imaginary point, when your gaze position (Fig. 1). From there, the viewpoint, the artist realizes a line on the horizon, where sit your scene. Fig. 1 – Horizon Line, Observer Viewpoint. Artwork Rosângela Vig. Another important element is the perspective vanishing point, this is where the image converges, as they look and distance from the field of view (Fig. 2). So all decreases in that direction, always following the same line, so that everything in the scene be proportional. All objects, people, trees or things that scene include, will decrease in the same direction of the vanishing point. Fig. 2 – Vanishing Point. Artwork of Rosângela Vig. On One drawing can be more than one vanishing point or many vanishing points, depending on the position that each object occupies in the scene. And the vanishing point can still be directed to the center, to the side or even upwards. In figure 4, for example, can be seen that the observer is positioned at the bottom of the church; the skyline is next to the church, gets in your eye level; and the lines of the vanishing point converge up. Fig. 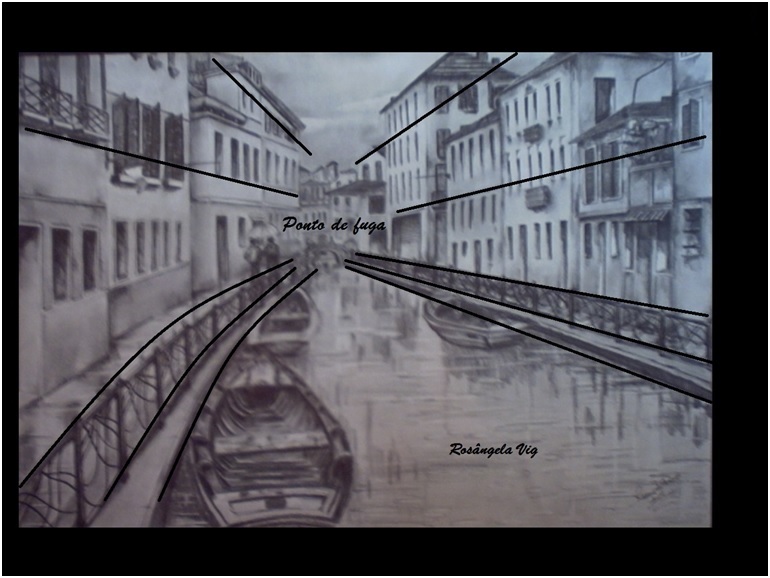 3 – Venice in Black and White. Artwork of Rosângela Vig. Prospective studies, allow the artist to sharpen the field of view to the world and to determine their sensitivity to Art. And when the artist feels in the image you are portraying, he participates and interacts with it. Fig. 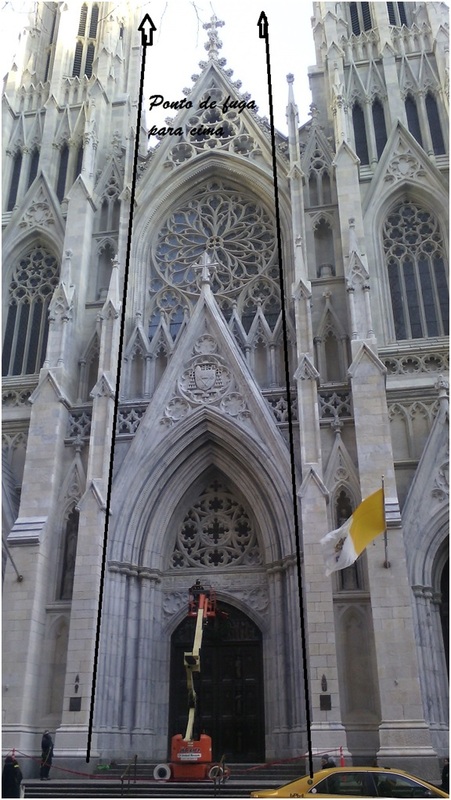 4 – Church of Saint Patrick, New York. 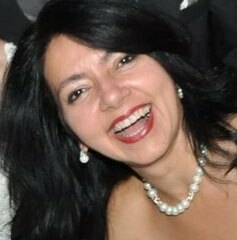 Photo of Rosângela Vig. LEONARDO DA VINCI, Grandes Mestres da Pintura, Folha de São Paulo, S.Paulo, 2007. WILDE, Oscar. O Retrato de Dorian Gray. 5st. Edition. S.Paulo: Ed. Scipione, 2006. Fig. 1 – Horizon line, Observer Viewpoint. Artwork of Rosângela Vig.